Lunch on Friday was a choice between Jason's Deli or Pasta Blitz. Truthfully, being in the restaurant industry, when I go out, I like to be waited on. Rightfully so, right? Anyway, Cynthia let me pick, and I chose Pasta Blitz, thinking it would be a sit-down lunch. However, upon arrival, I was surprised to see that I had to go to the front counter and place my order. Since I was thrown off, and very hungry, I only glanced over the menu for a short while. 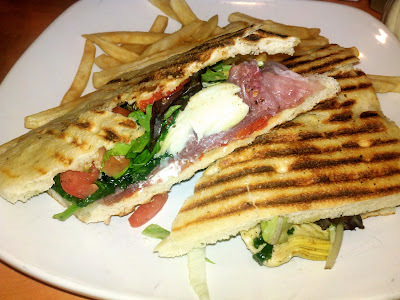 I knew I wanted a panini, though, so I opted for the Italiano Panini, which was Prosciutto, Goat Cheese, and Roasted Red Peppers... however, I saw on a different panini there was a "Spinach and Artichoke" spread, which sounded really interesting to me. I asked for the spread on my panini, and after the lady looked a little confused, she punched in some buttons on the computer, and said it wouldn't be a problem. I also couldn't pass up the Mushroom and Pine Nut Pizza, which I got a slice of, and-- I know, it's crazy-- had never had Arancini before, so I asked for one of those as well. Truthfully, we sort of got waited on, because after we ordered at the counter, they gave us a number placard to place on the end of the table, and someone brought over our food. I started with the slice of pizza. The one reason I got it was because of how thin and crispy it looked -- it reminded me slightly of pizza I would get from back home in Jersey, where you could just fold it in half like a piece of paper, and the cheese stretches after you bite into it, until you literally have to pull on it to break it. Well, this wasn't quite the same -- it could have to been heated up more, to get a crispier crust, and it was so incredibly thin, there was barely anything to bite into. The flavors were good though -- I like the idea of pine nuts on pizza. Especially with mushrooms. My sandwich and arancini arrived along with Cynthia's salad with grilled salmon (which is the same dish Cynthia gets every single time we go out to lunch!). I can't even comment on garden salads topped with either steak or fish anymore -- the lettuce was crisp, the fish was good, whomp whomppp. I'm skipping right to the goods -- my sandwich!! I have discovered my new favorite flavor combination -- goat cheese and prosciutto! I'm so glad I got spinach and artichokes on it, too. Everything just went together perfectly, and the bread was toasted just right. It wasn't too crusty or too hard, it was a great "panini" type bread. I will say, there was one good thing about Cynthia getting a salad -- their house vinaigrette was absolutely divine. I used some of it to dip my sandwich in, which made it even better, if that was possible.